Somewhat Americanized, the Jamaican-inspired fare at this Glenwood Park eatery offers toned-down heat to appeal to a broad market. 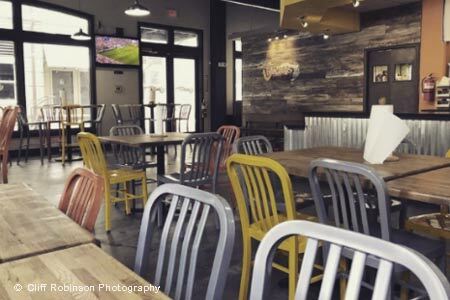 : Located in an upscale, mixed-use development, the quick-serve restaurant features bright colors and a lively atmosphere that make it appealing. Owner Winston Ferguson is enthusiastic about the food of his native island, Jamaica, and seeks to bring a taste of it to Atlanta. Seasoning on the dishes may seem bland to anyone from Jamaica or who looks for the characteristic heat of Jamaican cooking, but the dishes are well prepared if generally softly seasoned. A wide variety of sauces can help alleviate the condition. Target the jerk chicken and pork items. Hard-to-find callaloo is a classic companion as is fried plantain, and both are here. Cuisines merge, too, as in the jerk pizza, tacos and quesadillas. Steamed vegetables, salads and a veggie burger are also on offer. Get the rum raisin ice cream solo or topping the bread pudding. Beer and wine are available, but the selections are not exceptional.